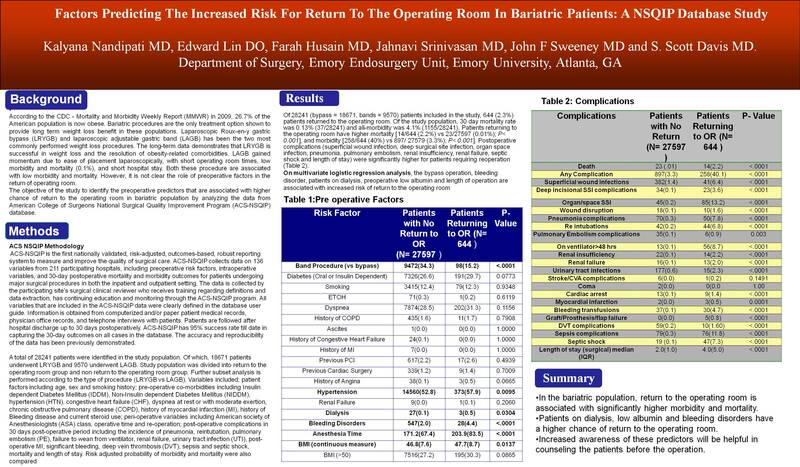 Objective of the study is to assess the risk factors associated with return to the operating room in bariatric surgery patients. Using the American College of Surgeons-National Surgical Quality Improvement Project’s (ACS-NSQIP) participant-use file, patients who underwent Laparoscopic Gastric bypass (LRYGB) and adjustable Gastric band (LAGB) procedures for morbid obesity were identified. Several pre, peri and post operative variables including 30-day morbidity and mortality were collected. Study population were divided into two groups; Patients returning to operating room (Group 1), and patients not returning to the operating room (Group 2). Variables analyzed include mortality and postoperative complications. Relationships between preoperative and perioperative factors leading to the return to the operating room were also analyzed. Univariate analyses were done using chi-square for categorical variables and two-sample T-tests for all continuous variables. Logistic regression models were created with all the variables that appeared significantly associated with returning to the OR in univariate analyses. Backwards model selection criteria were then used to eliminate those variables that were no longer significant in predicting a return to the OR while controlling for other factors. Of 28241 (bypass = 18671, bands = 9570) patients included in the study, 644 (2.3%) patients returned to the operating room. Of the study population, 30 day mortality rate was 0.13% (37/28241) and all-morbidity was 4.1% (1155/28241). Patients returning to the operating room have higher mortality [14/644 (2.2%) vs 23/27597 (0.01%); P< 0.001], and morbidity [258/644 (40%) vs 897/ 27579 (3.3%); P< 0.001]. Postoperative complications (superficial wound infection, deep surgical site infection, organ space infection, pneumonia, pulmonary embolism, renal insufficiency, renal failure, septic shock and length of stay) were significantly higher for patients requiring reoperation. On multivariate logistic regression analysis, the bypass operation, bleeding disorder, patients on dialysis, preoperative low albumin and length of operation are associated with increased risk of return to the operating room. In the bariatric population, return to the operating room is associated with significantly higher morbidity and mortality. Patients on dialysis, low albumin and bleeding disorders have a higher chance of return to the operating room. Increased awareness of these predictors will be helpful in counseling the patients before the operation.